The New People Artist Series was a range of documentaries released on DVD by American anime distributor Viz. As a collection they provide a fantastic insight into contemporary Japanese art in the middle of the last decade. 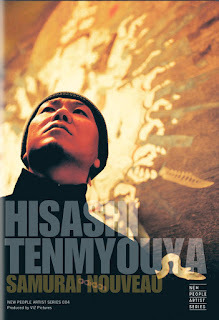 I enjoyed one of the documentaries, Traveling with Yoshitomo Nara, immensely, and this led me to watch a second: the 2006 film Hisashi Tenmyouya: Samurai Nouveau. Hisashi Tenmyouya is a former art director who abandoned commercial art to become a full-time painter. He draws his inspiration from 19th century Japanese painting, but adds a strong contemporary tone. Some of his more famous works include a Goddess of Peace armed with sub-machine guns, a feudal-looking Gundam robot, and a pair of samurai playing football (a commission for the Tokyo World Cup). Tenmyouya describes his art as 'new Japanese painting', and over the course of the documentary he explains this position and reveals much about the history of 19th century Japanese fine art. It's a fascinating insight into both a style of art and the titular artist himself. Tenmyouya is quite a quiet and thoughtful man, and some of the documentary's best moments simply involve him being interviewed about his art, his inspirations and his general outlook on painting in general. In between we see him setting up and launching exhibitions, chatting with other artists, and also get to see a range of his works to get a better idea of what his style of painting actually looks and feels like. Thanks to his informed and well-considered explanations on the two key art movements of most-Meiji Japan, the film also acts as an engaging history lesson. Technically the film is clearly a little rough, with a visibly low budget but a lot of dedication and heart. It does what a good documentary should, which is to provide an engaging and intelligent insight into its subject matter. I came away knowing Tenmyouya and his art much better than I did going in, and that alone makes the documentary a success. He is an interesting and fairly entertaining subject, which also helps to overcome the limited production values. There is a beautiful series of scenes in the film's first half in which we slowly see Tenmyouya complete an entirely new painting. Scene by scene we see him applying gold leaf to the background, composing the image of an armoured lion on top of it, and then meticulously paint it piece by piece. It's not only satisfying to see the image slowly come together; the close-ups of his working practice, materials and technique are invaluable for aspiring artists or even other professionals intrigued by his work. I have always been fascinated by fine arts, and the chance to see an artist work is always an intriguing and satisfying one. Samurai Nouveau proves no different.